Born in the Istrian city of Pola, now Pula in modern Croatia, Maximianus was consecrated Bishop of Ravenna in 546 by Pope Vigilius in Patras, Greece. Maximianus was a forty-eight-year-old deacon from Pola when he became the twenty-sixth Bishop of Ravenna. 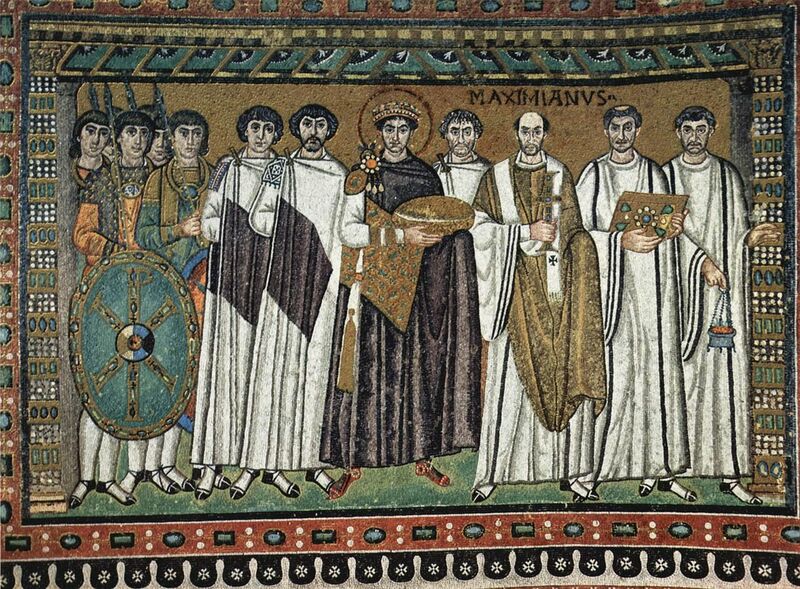 Ravenna was then the capital of the Roman Byzantine Empire's territories in Italy, and Maximianus's role may have included secular political functions. According to the ninth-century Ravennate priest Andreas Agnellus, Maximianus' flock initially refused his leadership, because he was selected by the emperor Justinian I and was not their initial candidate. To a modern art historian Meyer Shapiro, Maximian was "a poor deacon of Pola who rose to a high position through his political adroitness" as a protegé of Justinian I. 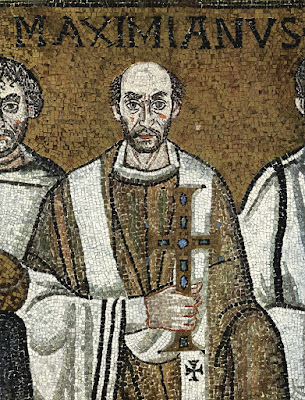 He had not been wanted as Bishop by the people of Ravenna, but "by shrewd maneuvers he overcame their opposition, and won their respect by his discretion, generosity, and great enterprises of church building and decoration." He completed the Basilica of San Vitale in Ravenna on May 9, 549, and also built Sant'Apollinare in Classe and several other churches. 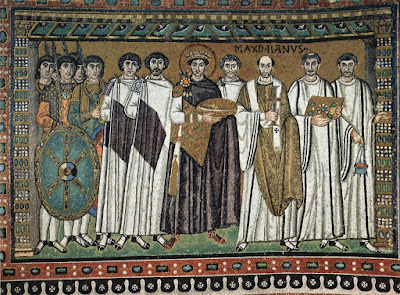 In a famous sixth century mosaic in San Vitale, Maximianus is with Emperor Justinian and his retinue. The Saint holds a jewelled cross and wears early versions of an alb, chasuble and pallium. Maximianus devoted himself to the revision of liturgical books and to the emendation of the Latin text of the Bible, and commissioned a large number of illuminated manuscripts. For the high altar in Ravenna he had a hanging made of the most costly cloth, which was embroidered with a portrayal of the entire life of Jesus. In another hanging he had portraits of all his predecessors embroidered on gold ground. Maximianus's most remarkable episcopal furnishing is the Throne of Maximianus, the cathedra of the bishop which was constructed entirely of ivory panels. It was probably carved in Constantinople and shipped to Ravenna. It consists of decorative floral panels framing various figured panels, including one with the complex monogram of the bishop. Maximianus died on February 22, 556. He is regarded as a Saint by both Catholics and Orthodox, though essentially locally venerated in Ravenna, where there is a church dedicated to him at Piazza S. Massimiano, Punta Marina. The Throne of Maximianus (or Maximian) is a throne that was made for Archbishop Maximianus of Ravenna and is now on display at the Archiepiscopal Museum, Ravenna. It is generally agreed that the throne was carved in the Greek East of the Roman Byzantine Empire and shipped to Ravenna, but there has long been scholarly debate over whether it was made in Constantinople or Alexandria. The style of the throne is a mixture of Early Christian art and that of the First Golden Age of Byzantine art. It is made of carved ivory panels, with frames of winding vines and grapevines, on a wooden frame. The throne itself is large with a high semi-circular back and may have held a jeweled cross or Gospel book for some of the time. 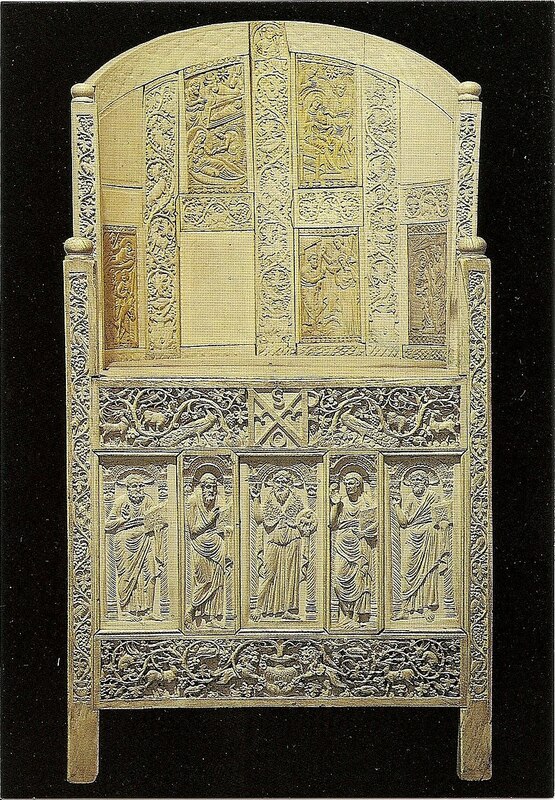 The ivory carvings are done in relief and the panels depict important biblical figures. 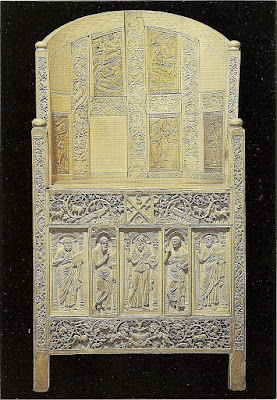 The back of the throne shows scenes of the Life of Christ, the sides include scenes of the Story of Joseph from the Book of Genesis, and on the front of the throne are the Four evangelists around John the Baptist, who is holding a medallion with the Lamb of God and Maximianus’s name above him. The throne portrays Justinian’s presence in Ravenna, which had been the western capital of the Roman Byzantine Empire. Maximian may well have acted as regent for the Emperor in the remaining Roman Byzantine territory in Italy, and it is possible that it was intended to be left as an empty throne symbolizing the authority of God or the Emperor, or both. Many had also believed that the throne was not intended to be of personal use by the Archbishop, but was to be an empty throne that symbolized the imperial or divine power. The cathedra was positioned in the center of the apse in the cathedral with the benches of assisting priests on either side. The throne was also carried during religious ceremonies. The decorated back and side of the throne suggested that the throne was designed to be moved out of the apse and placed near the chancel while the bishop addressed the congregation, instead of being left stationary against the wall. The gift was also for the dedication of San Vitale; Justinian hired 6th-century Roman Byzantine artists, who were summoned by the court to Constantinople from around the Empire, to create this piece. The style of the ivories and even the use of ivory itself suggest that the throne belongs to the School of Ivory Carving. It is also suggested, due to differing styles within the throne, that some components or even the entire throne was possibly carved in Alexandria. However, it is argued that the veneration of Saint Menas was not just confined to Egypt, but there was a church dedicated to him in Constantinople. One argument advanced for an origin in Egypt is the local relevance of the story of Joseph, which is given such prominence, but Meyer Schapiro demonstrates an artistic and literary tradition using Joseph, who rose to be minister to his pharaoh, as a symbol for the role a bishop, which at this period typically involved a considerable role in civil government.